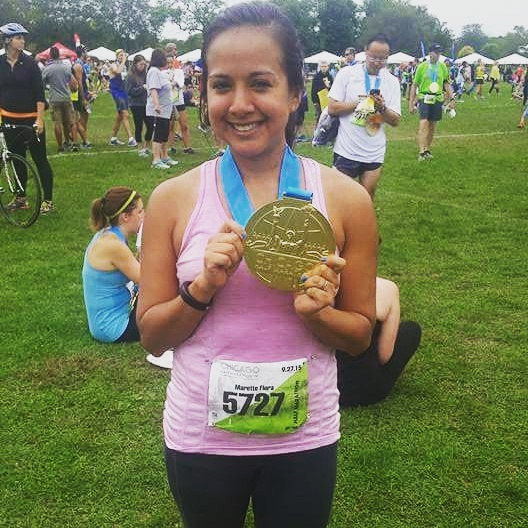 I signed up for the Chicago Half Marathon earlier this summer when I had grand plans to finish in a personal-best time. Then summer happened. I lost motivation. I still ran but my runs were about half the lengths I used to run. I half-assed my training, so I knew I wouldn’t get a PR, but I felt good going into the race Sunday. I started with about a 10:30 pace and maintained that for the most part. When we passed the Mile 7 sign, a runner sang, “Oh, we’re more than halfway there …” And the runners around me erupted in cheers. I had been losing steam but somehow got a power boost from hitting a spectator’s poster that said: “Hit here for power!” Thanks, stranger. Turning around on Lake Shore Drive also pumped me up. At Mile 9, I stopped for a restroom break. 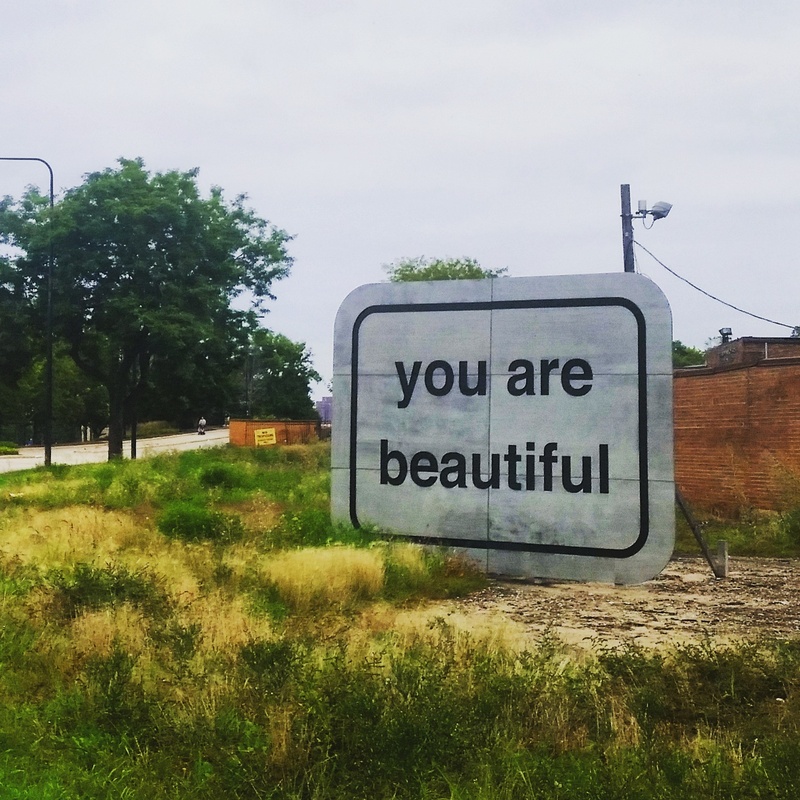 I paused for a minute to take a picture of a sign, too. Earlier in the race, I saw the men’s and women’s leaders on the other side of the highway, and I was moved. I held the tears in, though, because who cries during a race? For a moment it was hard to breathe because I could feel the lumps in my throat. Along the run, I saw about five posters that said, “Run faster, I just farted.” It was a little overdone. There was also the Christopher Walken poster that said, “No time for Walken.” But my favorite poster said, “I don’t know you, but I believe in you.” So nice. My time was 2:22:15. My running app said I ran 13.32 miles, not 13.1, but that’s typical. It was not my best time, but it also wasn’t my worst. I was actually quite pleased with my performance, and I didn’t feel sore after the race. It’s not all about time, anyway. I liked this race because it was run well. I was in and out of the expo in 10 minutes. I walked in, waited a couple of minutes for my bib, then walked into another room for the rest of my packet and my T-shirt. I appreciated that. I was a little annoyed that the last shuttles were scheduled to leave from the Belmont CTA station at 5 a.m., so Graham dropped me off at the race instead. I know that moving the shuttle schedule up was probably necessary, though. The race was on the south side of Chicago, so it’s quite a trek. After the race, we received chips, pretzels, bananas, a wet towel, water, Gatorade and pizza. (The bib had a beer ticket that I didn’t take advantage of.) By the way, the pizza was delicious. It was so unlike me to only grab one piece, even though I saw other runners get two. Cell service was spotty in Jackson Park, so I wasn’t able to get in contact with my running group friends. I decided to head for the shuttles and found myself walking another half a mile to get to the front of the line of buses. The bus left promptly as soon as it filled up, and we found ourselves riding down the bumpy streets of Chicago to the Belmont CTA station. From there I took the L home. It was quite the journey, but at least I didn’t have to take the train the whole way to Rogers Park. My favorite part of the race? The medal. It was a 6-inch gorgeous piece of metal. I loved it. The difference between this race and my last one was night and day. 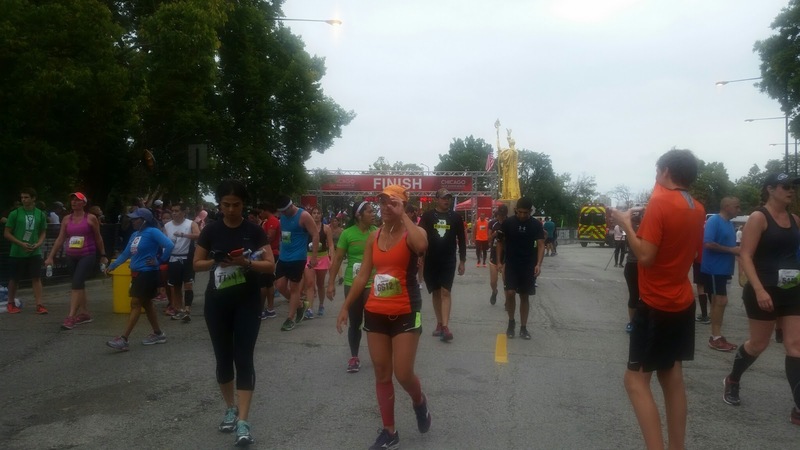 The temperature was in the 60s and 70s, it was overcast, and I only saw one runner need serious medical attention versus several at the last race. I would highly recommend the Chicago Half.